VMware lab who? VMware lab in pocket-size format! So in our last installment, I found out that I can upgrade my Shuttle SH67H ESXi servers to support Ivy Bridge processors. If you want to read more about that, feel free to visit my Compact VMware Server At Home post from Winter 2012, and my Upgrading my home VMware lab with Ivy Bridge post from Spring 2013. The replacement boards came in from Shuttle, and they’ll be going back into the chassis. But as you may have seen at the end of the last post, I discovered the Intel Next Unit of Computing server line. The NUC line current includes three models. All three have three USB 2.0 ports outside (one front, two rear), as well as two USB headers inside, conceivably useful for a USB flash drive or flash reader. 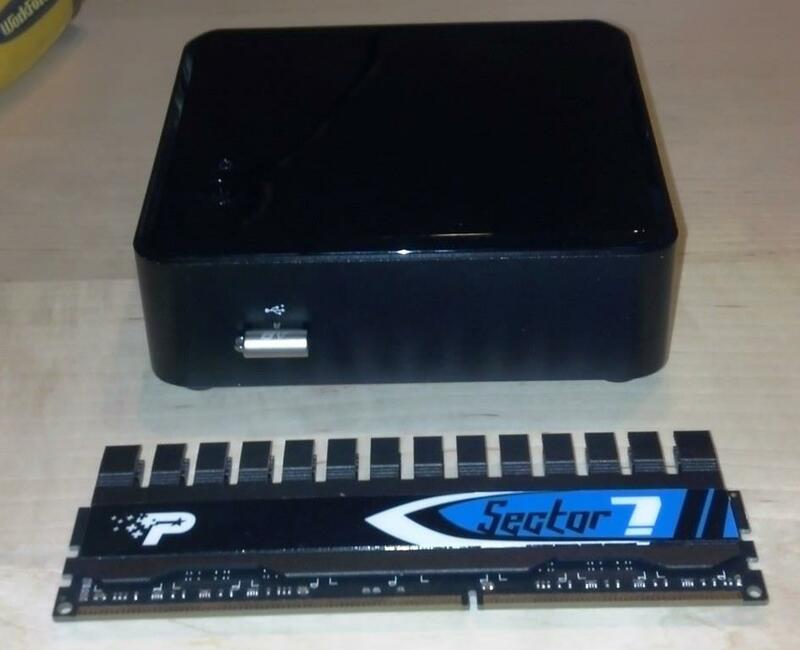 They also have an mSATA-capable Mini-PCIe slot as well as a short mini-PCIe slot suitable for a WiFi/Bluetooth card. And there are two DDR3 SODIMM slots, supporting a reported 16GB of RAM (the processor supports 32GB, but the board/kit do not mention this). They all include VT-x with EPT. I don’t see the Celeron being that useful for virtualization labs, but these are rather multifunctional for a little 4″ square computer. Imagine putting a broadband modem (3G/4G/Wimax) inside for reasonably potent portable kiosk purposes (VESA mount kit included). A card reader and a DVD burner for saving and sharing (and even editing) photos. Intel’s WiDi wireless display technology is supported as well, if you have a suitable receiver. Or use it with a portable projector for presentations on the go (no more fiddling with display adapters for presentations at your meetings!). But we’re talking about a VMware lab here. And let me get this out of the way… this was one of the coolest features of the NUC. That’s correct, the box has its own sound effects. Those of you of my era and inclinations may remember when KITT’s brain was removed and placed in a non-vehicle form factor on the original Knight Rider tv series. When I got ready to RMA my Shuttle motherboards, I was thinking about this sort of effect for a couple of VMs on the in-service ESXi server that was about to have its board sent to southern California. And that’s what I had to do. I couldn’t quite miniaturize the server Orac-style, but that thought had crossed my mind as well. So I picked up the DC327IYE unit at Fry’s, got an mSATA 64GB card (Crucial m4 64GB CT064M4SSD3) and a spare low profile USB flash drive (Patriot Autobahn 8GB (PSF8GLSABUSB) ) at Central Computers, and took a Corsair 16GB DDR3 Kit (CMSO16GX3M2A1333C9) from my stock. Assembling it took only a few minutes and a jeweler’s screwdriver, and then I was ready to implement ESXi. I backed up the VMs from the original system using vSphere Client, so that I could re-deploy them later to the NUC. Someday I’ll get Veeam or something better going to actively back up and replicate my VMs, but for the limited persistent use of my cluster (cacti and mediawiki VMs) this was sufficient. I originally tried reusing the 4GB usb drive my existing server was booting from, but it didn’t recognize the Ethernet interface. I installed a fresh 5.0u2 on a new flash drive, and still no luck. I found a post at tekhead.org that detailed slipstreaming the new driver into ESXi’s install ISO. I did so, installed again, and was up and running. I did have to create a new datastore on the mSATA card — my original server had used a small Vertex 2 SSD from OCZ, which obviously wouldn’t work here. But I was able to upload my backed up OVF files and bring up the VMs very quickly. And one warning I’ll bring up is that the unit does get a bit warm, and if you use a metal USB flash drive, it will get hot to the touch. 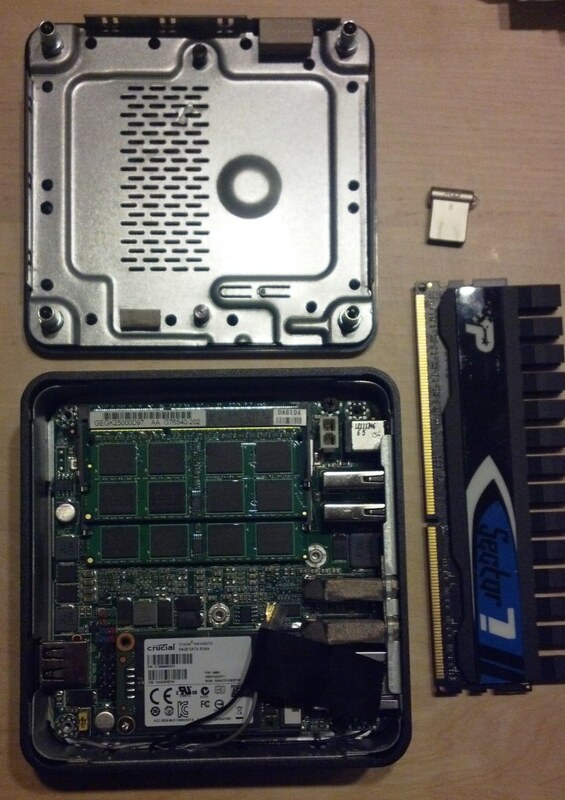 My original ESXi lab box used a plastic-shelled USB drive, and I’m inclined to go back to that. My next step is going to be bringing central storage back. There is a new HP MicroServer N54L on the market, but my N40L should be sufficient for now–put the 16GB upgrade in and load it up with drives. As those of you who saw my lab post last year know, it was running FreeNAS 8, but I’m thinking about cutting over to NexentaStor Community Edition. I’ve taken the original Shuttle box and replaced a mid-tower PC with it for my primary desktop. I will probably set the other one up with a Linux of some sort. And in a week or so I’ll grab a second NUC and build it out as a second cluster machine for the ESXi lab. All five of them are slated to go into my new EXPEDIT shelving thingie in the home office, and I’ll bring you the latest on these adventures as soon as they happen.